No manufacturer of global renown has ever gotten to be that way without daring to set high goals for itself, and Kitchener, Ont.-headquartered Dare Foods Limited is as fine a testament to the virtues of dreaming big and reaching high as any major Canadian food producer out there—even after more than 120 years in the highly competitive baked-goods business. Founded in 1892 by Charles Henry Doerr under the name of C.H. Doerr Company, the family-owned business that rose to iconic prominence as a manufacturer of delicious, high-quality cookies is nowadays also a major North American player in the market segments for crackers, fine breads, candies and other baked goodies and treats that busy modern-day consumers can’t seem to get enough of—including the very popular line of snack-bread products produced at the company’s highly-automated, 140-employee breadmaking facility in Saint-Martin, Que. Dare Foods’ Saint-Martin facility maintenance manager Matthew Beauchamp holds semi-finished boxes constructed by the high-speed Delkor Trayfecta S4 1502 carton former. One of six manufacturing plants operated by Dare Foods in North America—employing over 1,300 people in total—the Saint-Martin plant is home the company’s very popular line of Boulangerie Grissol brand portfolio purchased by Dare Foods in its 2001 acquisition of the cookie and fine breads business of the Montreal-based Culinar Inc.
Housing two baking lines and three packaging lines, the busy plant turns out the full range of Boulangerie Grissol brand products, including the perennial bestseller Melba toast, Canapé, Bread Sticks and Baguette Bites, along with the recently-lunched new favorites such as Morning Thins, thin crispy slices of bakery-style loaves with seeds, fiber and fruit for on-the-go mornings; Sweet Thins, a sweet calorie-controlled snack; and Artisanal Baguettes, a line of premium-quality, oven-baked baguettes made under authentic recipes and using fresh natural ingredients like black olives, cinnamon and raisin, or cranberry and figs. Pre-printed box flats ready to be placed into the Trayfecta S4 1502 carton former, to be glued into shape with the Nordson ProBlue 7 hot-melt adhesive applicating system. 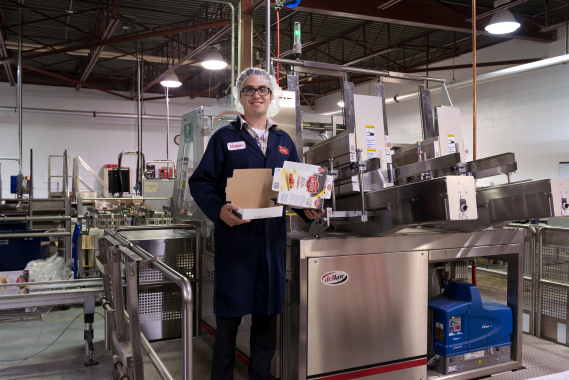 “We are a leading Canadian fine bread manufacturer,” says Saint-Martin maintenance manager Matthew Beauchamp, noting the company considers itself to be one of the leading players in the fine bread market segment across North America, despite growing competition from both imports and private-label store brands. 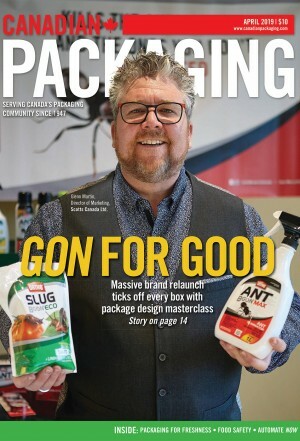 “Increased competition is a reality for us,” Beauchamp told Canadian Packaging in a recent interview, “but we constantly strive to remain competitive by launching new and innovative products. 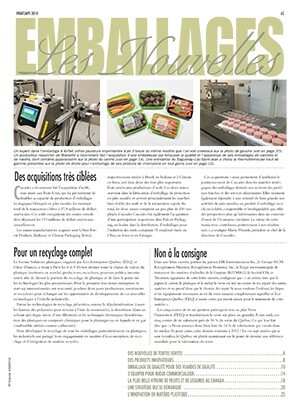 “We also look at our bottom line results with the realization that by constantly updating our manufacturing equipment, we will not only improve our production line speed and efficiency, but will also reduce our manufacturing costs,” says Beauchamp, citing four major facility expansions and innumerable equipment upgrades taking place at the Saint-Martin factory since it first started producing the venerable Boulangerie Grissol products back in the 1940s under previous owners. 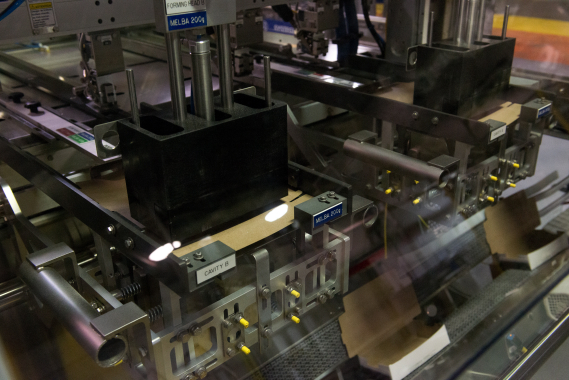 Flat paperboard sheets being pneumatically transferred inside the Delkor Trayfecta carton former to be glued and then assembled at high speeds. Despite the plant’s high-throughput rates and growing volumes, Beauchamp says the facility does not take any shortcuts that would in any way undermine the final quality of the product manufactured at Saint-Martin. “After fresh ingredients are mixed in batches to produce dough, we process it into various pans, and bake it in large ovens,” he relates. “After de-panning, the cooked loaves are placed onto large wheeled racks and are refrigerated for several days to ensure most of the humidity is removed. 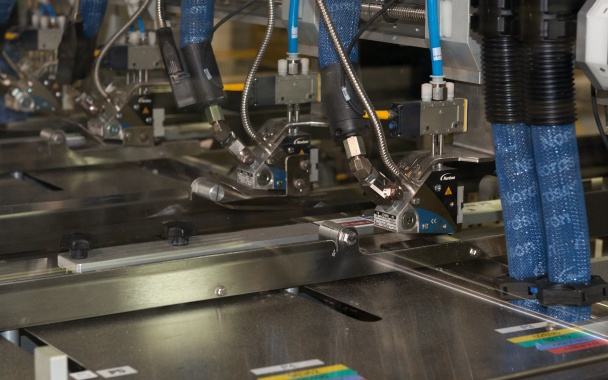 The Delkor Trayfecta system utilizes the Nordson ProBlue 7 hot-melt adhesive dispensing and applicating system for forming the paperboard cartons at high throughput speeds. “Removing it from the refrigerated section, we slice the now-dry bread, and further toast it on a processing line specific to the type of cut and packaging required,” Beauchamp expands. 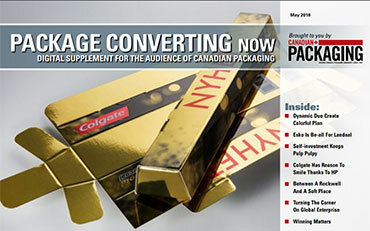 For a company that is often credited with rewriting the book on cookie packaging in Canada, having borrowed a trick from coffee packaging and introducing the tin-tie strip to cookie packaging in 1954 to make it a new de facto cookie industry standard, the performance of packaging machinery and equipment at the Saint-Martin facility naturally get all the close scrutiny and attention it duly deserves, according to Beauchamp. 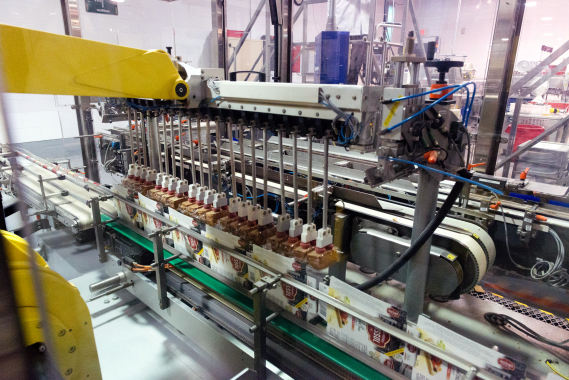 A close-up of the Trayfecta carton forming machine shows cavities being formed in the cartons to make just the right amount of space for the packaged product. “When I became the maintenance manager for the Saint-Martin plant last year, I noticed early on that an existing carton former that was in use on one of our major line was not up to par,” he says. “Relative to our needs, it was a poor design that featured overly complicated changeovers and adjustments that, quite frankly, caused us a lot of unnecessary downtime. 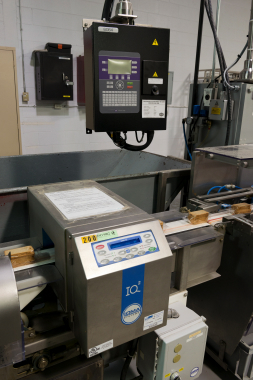 Delkor Systems, Inc., a St. Paul, Minnesota-headquartered designer and manufacturer of packaging machinery, installed a brand-new Trayfecta S4 1502 model case, carton and tray former at the Saint-Martin facility. According to Beauchamp, it was when he worked for Dare’s engineering department that he first considered them for a project. “I was impressed by the equipment that they offered, but unfortunately, that project fell through,” relates Beauchamp. The Markem-Imaje 6064 thermal ink coder and the Loma IQ2 metal detection system pair up for optimal product coding and quality assurance. 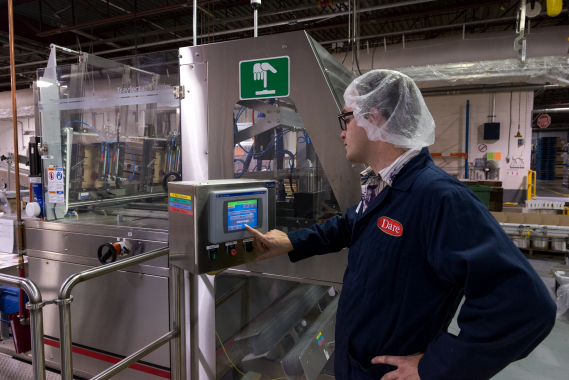 According to Sowa, the Trayfecta S4 1502 was the best possible solution for Dare Foods, allowing it to utilize two heads for the higher rate, while only one head would be required for the slower rates, a flexibility offered by the machine that is considered to be unique in the business. 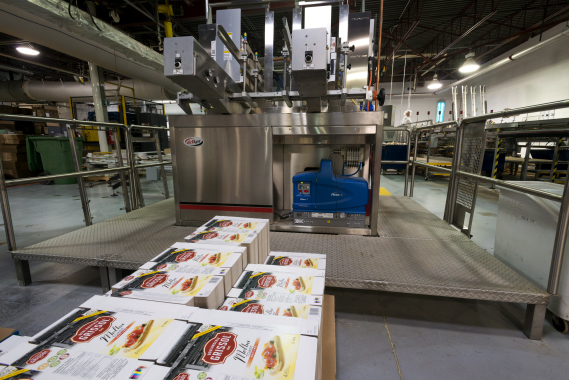 “We actually design and manufacture three other carton formers, with another having four heads allowing for forming speeds over 200 cartons per minute, but the 1502 matched so perfectly for this mix of size and rate required, that it was a no-brainer for us to recommend it to Dare Foods,” advises Sowa. He adds that since Dare required a nominal rate of 78 with a surge rate of 90 cartons per minute for their fastest requirement. Ability to run three materials: paperboard, corrugated and microflute materials with just a minor tooling change. “You might note that Delkor seems to be a wee bit obsessed with the number three—but when we are talking about the Trayfecta series, it is by design, as it is a play on the word ‘trifecta’, bringing the power of three to the forming applications,” reveals Sowa. “The Trayfecta can also run three different package formats—cartons, cases and trays, and handles glued, locking and fold-over lock designs,” he expands. To handle rough going at Dare Foods, the Trayfecta S4 1502 boasts a robust construction with fixture head slide guides that maintains a stroke tolerance within 0.008-inches for repeatable and close tolerance motion. The Trayfecta S4 1502 utilizes a Rockwell Automation Allen-Bradley brand PanelView Plus 700 for easy operator interaction, and a ProBlue 7 hot-melt adhesive system to seal the cartons, cases and trays, manufactured by Nordson Corporation. Now using the Trayfecta S4 1502 for cartoning of the Melba toast products, and the new Sweet Thins and Morning Thins products, Beauchamp is quite happy with the whole project. “Everything worked out very well,” he begins. “The machine was up and running in no time, and it passed all the SAT (site acceptance test) and commissioning at a 99.5 per cent efficiency. 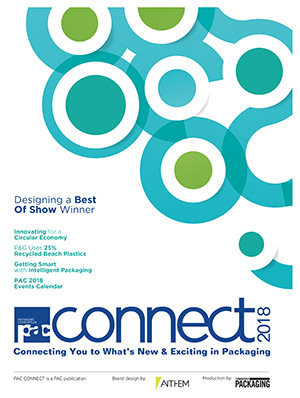 “We went from a two-hour changeover that took another two hours to fine-tune in production with our old machine, to a less than 10-minute changeover that generated perfect cartons in the first cycle after startup,” recalls Beauchamp. Sowa concurs, noting that Delkor performed substantial testing prior to the customer’s factory acceptance test. “Once their team arrived, we followed Dare’s extensive protocol to prove the machine,” says Sowa. 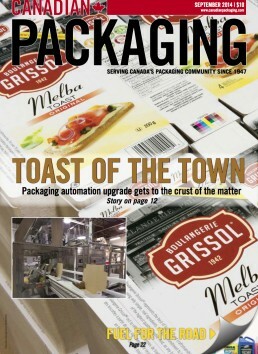 Dare Foods employs a robotic top-loading system to execute gentle and efficient placement of packs of Melba toast in the outer boxes. Beauchamp says he was also happy about the fairly simple training for Dare Foods’ operators. “After only about 12 hours of training, a new operator could run and perform changeover with the Trayfecta within the required time,” Beauchamp says, noting that Delkor’s assembly technicians also serve as the installation service support. “As such, when we do our extensive training with the customer in our facility, and follow through at the installation with the same technicians, we can provide a training service that is perfectly in tune with people who are familiar with not only the tray former, but also Dare’s requirements,” relates Sowa. flexible stand-up pouch packaging machinery for the new Boulangerie Grissol Artisanal Baguettes products. Machine operator using the Allan-Bradley PanelView Plus 700 terminal to monitor and control operations of the Delkor Trayfecta S4 model 1502 carton former. Beauchamp says he is convinced that the bakery will continue to move forward to be the best in the market segment. The humble start to the Dare Foods empire began when Doerr began making and selling hand-made cookies at his own grocery store located in Berlin, Ont.—a predominantly German community now known as Kitchener, about an hours drive west of Toronto. By the time World War I had ended, the company a locally well-known and fairly successful cookie and candy business. Unfortunately, Doerr’s son Webourne and daughter-in-law Irene both died of the Spanish Flu of 1918, but he carried on by running the business and raising his infant grandson, Carl. By 1933, Carl began working at the family business and took over at the age of 24 when Charles passed away in 1941. After the factory burned down in 1943, the business-savvy Carl bravely proceeded to rebuild and modernize the factory, and change his family name. Perhaps because his family name was of Germanic-origin, and Canada was at war with Germany, Carl surmised that a name change might be good for business, proceeding to change both his surname and company name to Dare, and soon after starting to ship product to all regions of Canada. Not content with just producing food products, the company also took an active role in its food packaging. In 1954, Dare Foods took a coffee packaging concept and introduced cookie packaging to the tin tie-strip. The new format allowed consumers to reseal the bag to better maintain the product’s freshness, ultimately becoming the de facto standard of cookie packaging in Canada. By 1956 the company had penetrated into the lucrative U.S. market, and in 1983 introduced the popular Breton cracker line, which became a bestseller in both Canada and the U.S. In 2003 it became one of the first companies in North America to turn all its facilities peanut-free in response to public concerns over nut-based allergies. Manufactured in Canada and the U.S., Dare Foods has a wide range of cookies, crackers, fine breads and RealFruit candy all of which are available throughout North America and in more than 30 other countries around the world. 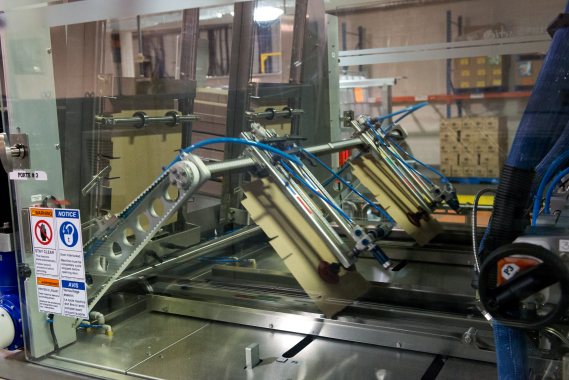 Formed cartons exit the Trayfecta S4 system via conveyor to be filled with product. 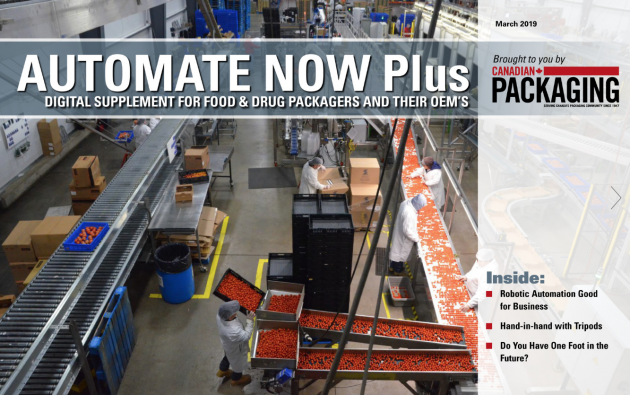 An SEW-Eurodrive motor powers the conveyor line leading cartons to the product handling robotic station, where the wrapped products are placed inside cartons formed by the Trayfecta S4 model 1502 system.